I am one of the thousands of people afflicted with sleep paralysis. Most nights my sleep is undisturbed. I lay down, dream, and wake up. Night after night. But sometimes when I wake up I can’t move. I dread those times. It always happens the same way. My bedroom door opens in my dreams and a dark figure watches me from the doorway. The fear is so intense, and I can’t move. My limbs feel like they’re made of lead. I struggle, I fight, I try to cry out for help. My heart beats, rushing through me as I struggle to move. And that figure keeps staring at me, hating me. And then, like I had broken the cobwebs that bound me, I could move and spring up. My bedroom door will be closed, the dark figure will be gone, and the fear will bleed off me. But I can always feel it lurking. I can’t go right back to sleep or I’ll slip back into the paralysis. I can never predict when it will strike, but I can often recognize the signs in my dreams when an attack, for lack of the proper word, comes upon me. My bedroom door opening. If that happens in my dreams, I wake up before my body paralyzes. So if you’ve never heard of sleep paralysis, it is a little understood condition. While either falling or sleep or waking up, a person can get locked into complete muscle atonia and often have terrifying nightmares of intruders in their rooms accompanying their complete helplessness. Some attribute this to demonic activity, and after experiencing it, I can understand why. 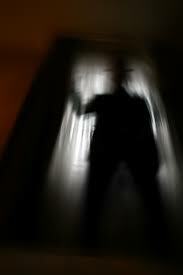 When I’m in the grip of the paralysis, and the dark figure is watching me, nothing has ever frightened me more. The ‘intruder’ as the figure is called in medical literature, is thought to be caused by a hyper-vigilant reaction in the brain caused by finding yourself unable to move while you’re still not fully awake and causing your dreams to react accordingly. It is thought that sleep paralysis is responsible for tales of succubus, incubus, demons, UFO abduction, out-of-body experiences, and host of other, similar tales. Science still doesn’t fully understand the causes of sleep paralysis and there are numerous theories explaining it. Luckily, it doesn’t threaten your physical health, just your sanity. Something I try and focus on when I’m in the grips of it as I lie they’re helpless. But it’s hard to remember that the figure isn’t really there. Last year, after a particularly bad incident, I wrote a poem about it. All day the figure had haunted me and writing down my fears went a long way in shaking off the experience. Thanks for sharing. Good luck on your indigogo project. I’m sorry you experience that so often. I’ve experienced it a couple times, and it was when I was living in a house that housed lots of ghosts. The most memorable night was when I felt something pushing down on my body, and I could not move. I could not scream. I could see my husband laying next to me, but I couldn’t reach out to him to let him know what was going on. I hope you find a way to stop these awful nights. Oh, no…all of my experiences have been long gone since I moved out of that house. There were many rumors circulating that the neighborhood was built on an Indian burial ground. I believe it. It wasn’t just our home, but many of our neighbors also experienced very odd things. Nights were always the scariest for me. Glad you don’t experience it anymore. The attacks are very rare. I went a year and a half between attacks once. You don’t believe in ghosts? I believe in spiritual entities. Whether that has anything to do with sleep paralysis, I have no idea. On a lighter note, have you seen the movie Dark City? Ghosts, demons, aliens, or the Dark City Theory. Who knows! Wow that sounds scary. I have a family member with a similar situation. He sometimes wakes up and starts walking around the house not aware he’s walking can often hurt himself. As for your story, JMD, almost has a paranormal feel to it. The sleep paralysis attacks I have definitely have a paranormal, demonic feel. Not all the attacks though. But the really terrifying ones involve the watcher. This looming figure is mostly new to me. My attacks definitely happen while waking up from a nightmare, generally, and are accompanied, not just by the inability to move, but also by the feeling that i cannot breathe. I think this is easily because my breathing is still slow and shallow like I am asleep, but my waking brain believes I should be getting much bigger breathes since I am partially awake. That leads to a panic, and I try to scream, to move. If I fight hard enough, I can move my mouth and neck, but nothing comes out, and my neck will often begin to shake and seize waking up my husband. Once I can get a finger to move and touch and feel anything I can begin to move and get up, but if my neck seizes, I am in for a lot of pain the next day. I can’t go straight back to sleep either because it will just happen again. I’ve had this all my life but had never had it defined until I came across a forum about it in adulthood. For obvious reasons, I cannot take it on a regular basis, but medications such as Klonopin, Xanax, and Atarax have helped and/or stopped it completely while I’ve taken them. I would assume this points to it being a possible part of an anxiety disorder? Sorry yours happens so frequently. And I understand what you mean about not being able to fall back asleep or it starts to happen again. I never knew this had a name. It happens to me every few months. It seems to last for hours, but I’m sure it’s only a few seconds. I actually feel better knowing it’s a “thing”. Yeah, it’s a thing. Sorry it happens to you so often.